During my family’s recent trip to the west side of Michigan, we spent a day at Ludington State Park. Ludington is approximately 25 minutes from Barothy Lodge, where we were staying for a week. 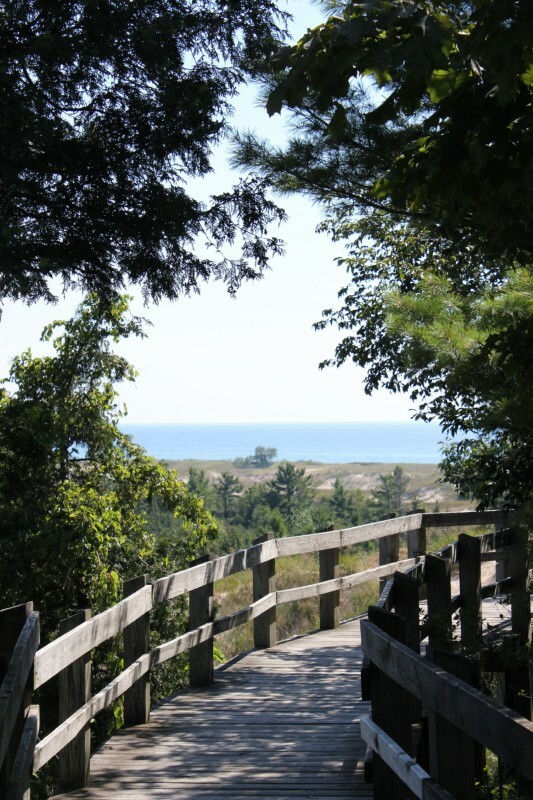 Ludington State Park is a 5,300-acre park located on seven miles of Lake Michigan’s shoreline. The park is an instant oasis of varying environments – sand dunes, hardwood trees, and marshlands. There are numerous activities to enjoy – from relaxing on the beach to miles of hiking trails to canoeing or kayaking to fishing to climbing the sand dunes. You definitely won’t get bored at this park! It was a beautiful summer afternoon when we arrived so the park was busy. I am always happy to see so many people enjoying our amazing state parks and outdoor recreation opportunities. My mom’s friend had suggested we visit Hamlin Lake, which is inside the state park. The 12-mile long man-made lake touches Manistee National Forest, as well as sand dunes and forests. The beach area is large with concession stands, restroom and canoe/paddle boat rentals. paved trail takes you from the dam along the lake. There are several benches to relax on along the way. We decided to check out the Skyline trail, which goes along a tall sand dune ridge. To get to the trail, you have climb up approximately 150 steps! I was most impressed that our 2-year old niece insisted on walking up the steps – and she walked back down later. What a trooper! The view at the top of the Skyline trail was gorgeous – you can see Lake Michigan past miles of sand dunes. We walked along the trail for a bit before coming to a deck area with benches and steps down to the sand dunes. The kids had a blast running up and down the sand dunes. After we walked back down the steps to the main trail, we rested near the dam to watch some fishermen. Then we walked along the beach before heading toward the north end of the lake for dinner. You won’t get the finest cuisine here but the view was pretty and they pour a good ‘black & blue’ beer. After dinner we headed to downtown Ludington. Justin promised the kids ice cream (such a great uncle!) so we stopped at House of Flavors. We all indulged in the cold treats. Then we went to Stearns Park Beach to play on the beach and watch the sunset. It’s a short walk down the pier to the light house, plus there is free parking and an accessible walkway for wheelchairs, strollers and those who find walking through sand difficult. The sunset was gorgeous – a nice reminder of how quickly times flies and how important it is to enjoy moments like this. I plan to make a lot more of these type of memories. I hope you do too. Note: A state park recreation pass is required for entry into the park. You can purchase at the park for $11 or purchase when you renew your license plate.